Clean Water Action was honored to once again work with the Geraldine R. Dodge Foundation in greening the Dodge Poetry Festival in Newark. We have been coordinating the Dodge Poetry Festival greening operations since 2010 and this was one of our best events yet! The Dodge Poetry Festival, which took place at the NJ Performing Arts Center (NJPAC) in October 2018, drew about 14,000 attendees over the course of its four days. With so many people gathering in one place for live poetry and refreshments, trash is definitely an issue. The waste problem is compounded by the fact that it all ends up in the polluting, waste-burning facility located right within the city. This is where we come in. Our ReThink Disposable Green Team, made up of our dedicated staff and volunteers, implemented effective zero waste practices and operated trash, recycling, and composting stations throughout the event to minimize the amount of waste that would end up in the incinerator. During the festival, all food waste, recyclable containers (glass, plastic and metal), cardboard, and paper were appropriately separated from the trash and then weighed. Even with clearly marked bins at waste stations, it can still be difficult to make sure people throw away their trash in the proper place, so each of our stations had a friendly volunteer to help educate festival attendees on what can be recycled and composted and on where our trash really ends up. 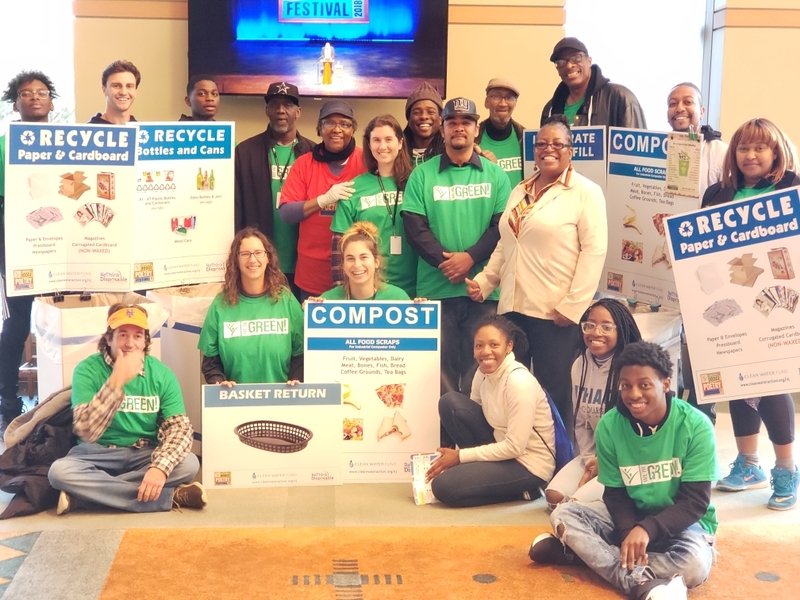 Despite the lack of commercial composting available in New Jersey, we were able to contract Community Compost Company, a New York-based composter, to accept food scraps from the festival. We expanded our ReThink Disposable program, which uses practices that eliminate waste by substituting “single use disposables” (SUD) with reusables wherever possible. With our help, the food truck vendors serving at the festival switched from Styrofoam and plastic clam boxes to washable plastic baskets lined with a single sheet of compostable paper. Through our careful sorting and by providing reusable baskets, we were able to prevent and divert over 1 ton of waste! We would like to extend a huge thank you to the staff at Dodge, NJPAC, NICO Kitchen + Bar, and everyone who volunteered to make this such a success! We are looking forward replicating these efforts at more events and to greening the next festival in 2020! Check out more photos here. If you are interested in learning more about ReThink Disposable, please contact me at mtoomey@cleanwater.org.